This is a series of three posts. 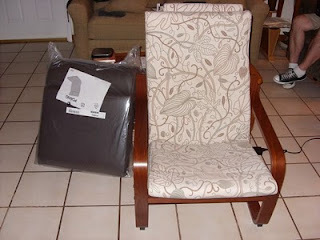 I had done a review of some sorts on my Poang chair a while back. It gets hit at least once a week, usually every other day. Ikea does not host reviews, and as a result there are many sites that will tell you about their products, chapter and verse. I was at the first store in the United States on the day that it had opened in Plymouth Meeting, PA. It was there and then that I had sat in one of these chairs and thought that it was a sturdy and comfortable piece of furniture. I didn't know then that it was an iconic piece and wildly popular. For my body type, it also is probably the most comfortable chair I have ever sat in. I'm sitting in it now as I write. You can see the chair here. I bought the thing at a local thrift store, and it was almost perfect. It had a worn seat cushion on it, and it still was comfortable. I have no idea how long it was used before I got to it, but I could have gone on with it for a long time. What changed was that I had gotten a job and could afford to get the seat to be the one that I really felt was the ideal one for my back. The difference being that the seat cover on that one was brown leather and the pillow on that cover was not snapped to the back of the frame of the chair. You can see the chair in the picture, and to the left is the package of the seat covers on the right. Simple packaging, and a flat pack as you'd expect from Ikea. The cushions are firm, but like all will form to your body after a while. The original cushions are fabric covered which is removable and machine washable, which I did immediately after purchase. Leather needs to be cleaned by another method of course. The cushions inside were of a foam rubber, and there are many options to replacing those as time and your use takes its ravages on them. What it didn't do was to make the pattern any less odd looking, and I really did want the leather ones. The whole process of the upgrade took all of 10 minutes, most of that time being involved in taking pictures of the thing. Is blogging so last year and long winded?